Review posted March 13, 2018. Alfred A. Knopf, New York, 2016. 279 pages. 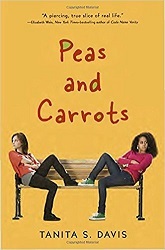 Here’s a contemporary novel about a teen in foster care. It’s been years since Dess has lived with her baby brother. She got kicked out of her last foster home and has been in group homes ever since. But now, when she asks to see her brother – she ends up getting placed in the home he’s in. There’s even a sister who is fifteen, just like Dess. Just because two teens are the same age doesn’t mean they’ll get along. The book alternates perspectives between white-skinned Dess and African-American Hope, her new foster sister. The girl looks right at me, and her eyes get all wide. She’s darker than Foster Lady and shorter, but thick like her, with a crinkly mess of puffy hair in a sloppy bun. She’s all baby fat and big cow eyes, which I’m about to slap out of her damn head if she doesn’t stop staring at me. So this was Austin’s real sister – his birth sister. This girl, with her pale-blue eyes and dragon-lady nails, looked nothing like Austin, whose skin was a sandy brown, whose eyes were a dark hazel, and whose hair was tightly furled golden-brown curls. Hope searched for any trace of resemblance to Austin’s sharp-chinned, round-headed adorableness in the single wary eye, ringed hard with liner, that glared out at her from beneath the sweep of stiff, blond bangs. Half siblings could still look alike, but . . . no, nothing. Dess isn’t used to a loving family, and is skeptical of the “rule” of acting with kindness. Hope isn’t used to having a foster sister her own age who isn’t, actually, very nice to her. Then at school, Dess seems to be able to make friends more easily than Hope, which is completely disorienting for Hope. But eventually, through the ins and outs of everyday life, the girls learn to care about even someone so different. This story had me reading until far too late in the night. Your heart goes out to Dess, with her tough family situation, but also to Hope, just trying to be kind but also wanting to be noticed in a family that is so much about service, sometimes Hope gets overlooked. The people, the friendships, and the school situations felt true to life. You’re pulled into caring about these girls. The reader gets to see both perspectives, and it’s beautiful to watch them slowly inch toward each other.